Paintings, drawings, iPad time-lapse and digital drawings. Jeff Dion is a painter and art Professor who lives and works in Philadelphia PA. Contact him for commissions - portraits, landscapes, figure paintings and drawings. He works traditional and digitally. Click on a review to enlarge...………………………………………………………………………………………………. 2017	Philadelphia Sketch Club - Philastration, Phila PA.
2017	Oxford Art Alliance - National juried Show, Oxford PA.
Winter 2016	Catamaran - Art and Literature My paintings Signals II and Coal Rig were used in this issue. December 2013 ‘Art and cutting edge Technology; of geeks and artists’. A thesis on the use of the most up to date technological advances to produce art. 2016 - Present Villanova University - Instructor of: Basic Drawing. 2002 - Present Moore College of Art and Design - Instructor of: Life Drawing III and IV, Pictorial Fundamentals, Narrative Painting, Drawing People, Drawing Faces, Life Drawing, Oil painting, Foundation Drawing, Advanced Drawing, Figure Painting, Watercolor Painting. iPad Digital Painting and Drawing. Foundation Drawing Committee: writing course descriptions - 2011. Technology Committee developed the iPad as a school wide tool. Middle States Review - Collected, labeled and hung Foundation work. 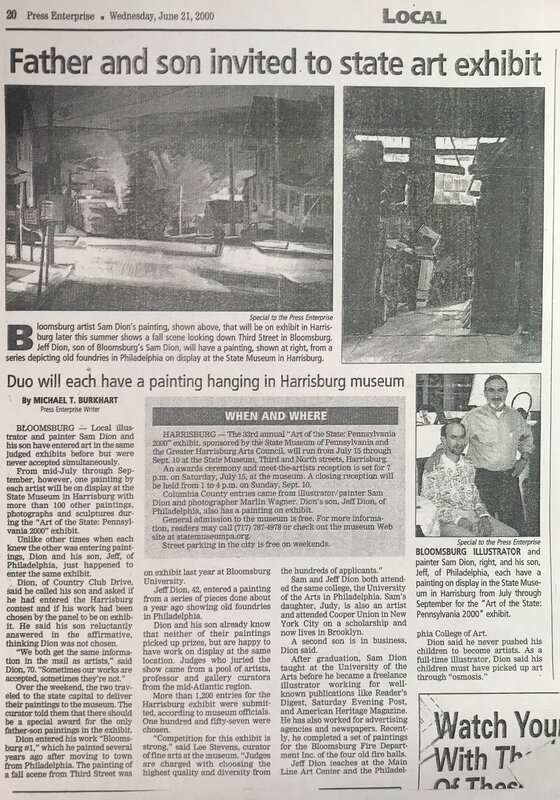 1991 - 1996 Manayunk Art Center - Instructor of Painting / Drawing. Board Member and Curriculum Director. 2015- Present Designed and run the online Facebook Adjunct Artist Gallery -Exhibition and monthly shows of Adjunct teaching artist. 2014	Philadelphia Sketch Club First Annual Digital Arts Show. 2013	Philadelphia Sketch Club The Annual Domenic DiStefano Memorial Works	on Paper Exhibition. Participating with; fund raising, monthly meetings, curriculum development. Curriculum Director: Responsibilities include hiring of teachers and developing class syllabi. Participating with fund raising, monthly meetings, show installations. 2014	Penn Valley Elementary School - iPad lesson to 5th grade. Self-employed commercial art - 1978 to 1998: Illustration, designs, layout, lettering, signs and murals for Philadelphia area business including, The Philadelphia 76’ers and Pat Croces Sports Physical Therapist. Excel Physical Therapist - 7 murals in 7 physical therapy centers in PA.